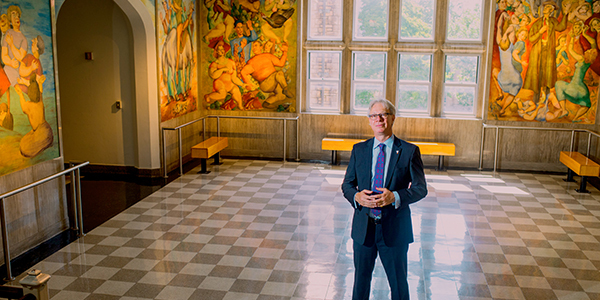 Every year, hundreds of students, faculty, staff and visitors pass the vibrant murals of Luis Quintanilla, the Spanish expatriate who spent part of his exile from Spain creating the work for the University of Kansas City (UKC). Julián Zugazagoitia, director of The Nelson-Atkins Museum of Art, has a compelling connection to the murals — one he only discovered when he saw them firsthand. Zugazagoitia had lived in Kansas City for ve years before he climbed the marble steps to the second floor of Haag Hall to investigate the legacy between his family and Kansas City. Quintanilla and Zugazagoitia’s grandfather, also named Julián Zugazagoitia, were friends and soldiers in the Spanish Civil War, fighting the fascist regime of General Francisco Franco. Quintanilla and Zugazagoitia had been in prison together in Spain in 1934, where the artist sketched his friend and compatriot. It was a bold move for the college president, considering Quintanilla’s political past. Decker, a vocal proponent of the arts and culture, used his role at the university to cultivate relationships with many politically informed artists. At the time of Decker’s invitation, Quintanilla was living in New York as part of the Rockefeller Foundation’s Committee for Displaced Scholars and Artists program that brought oppressed and imprisoned artists from Europe to the United States. His art had recently been shown at the 1938 World’s Fair in New York. Quintanilla envisioned four panels using Don Quixote’s story as an allegory of the horrors and oppression of fascism in Europe. The artist used members of the university faculty and staff as models. His own family appears in one panel. Zugazagoitia, who was aware that Quintanilla used family and friends as models in his work, expected to and his grandfather’s face looking back at him from the walls. This was not the case, but what he discovered was even more powerful. Beyond his personal connection, Zugazagoitia was reminded how significant it is to be an immigrant. He sees the murals as a reminder of what it takes to make your way in a foreign place. “It underscored for me how important it is to reinvent yourself in a new country. It seems the perfect time to be talking about this,” he says. Zugazagoitia emphasizes how important it is to preserve these murals. Besides recognizing the work for its artistic and historical merit — it is one of only two Quintanilla murals that were not destroyed during the Spanish Civil War — he believes living with art changes those who are exposed to it.